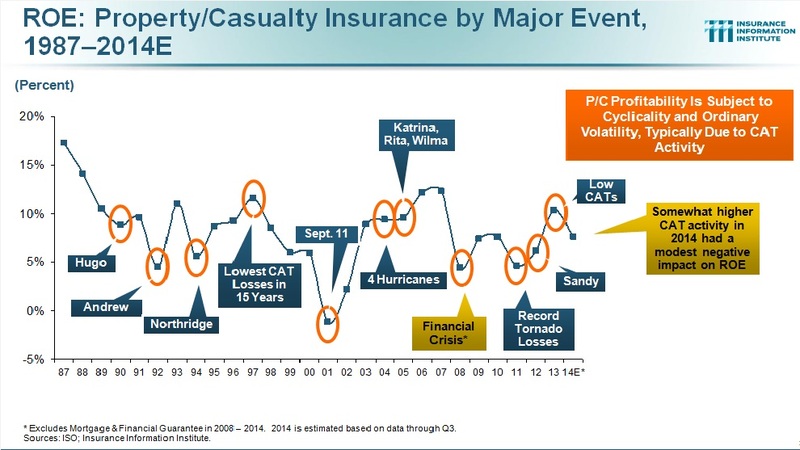 By now you’ll have read the headlines that the U.S. property/casualty (P/C) insurance industry’s $42.6 billion profit for the full year 2016 was 25 percent lower than its $56.8 billion profit for 2015. Putting some context around the numbers is important. 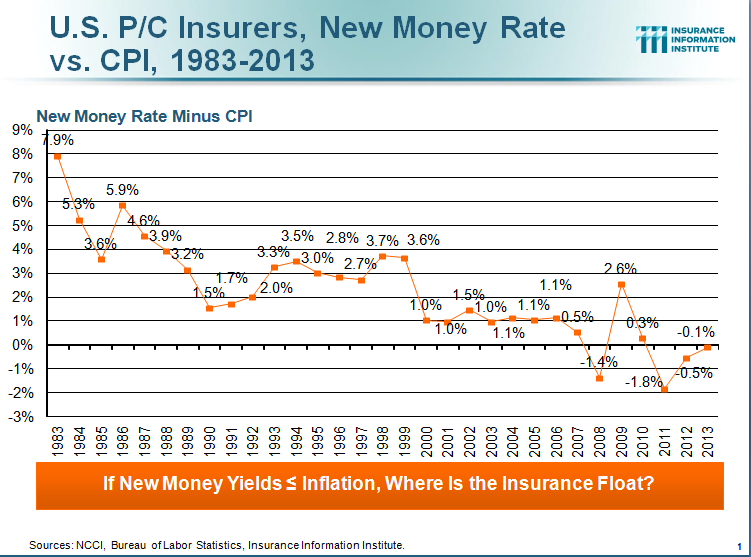 —Despite the challenge of ongoing low interest rates, weak domestic and global economic growth and rising claims, the industry nevertheless posted a modest 2.7 percent net written premium growth (compared to 3.5 percent in 2015). 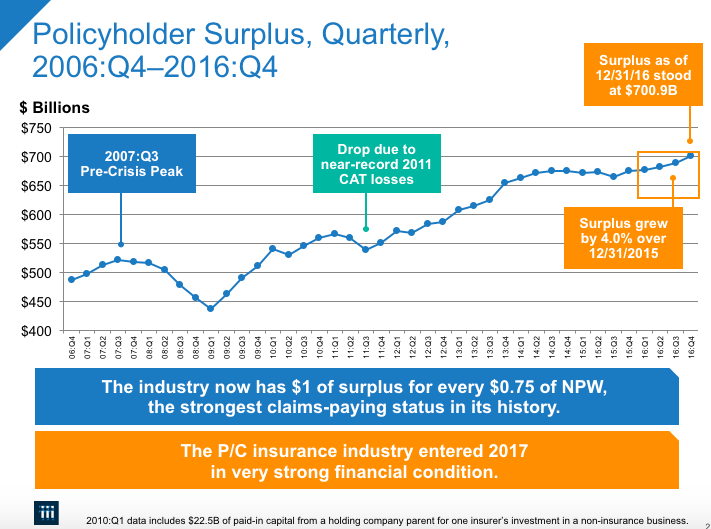 —Overall industry capacity (policyholder surplus) rose to $700.9 billion (up 4.0 percent) as of December 31, 2016. This is a new peak for industry surplus. The industry results were released by ISO, a Verisk Analytics company, and the Property Casualty Insurers Association of America (PCI). 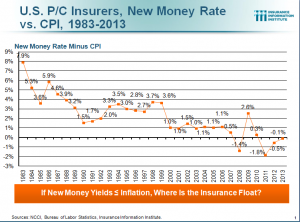 The property/casualty insurance industry is, and will remain, extremely well capitalized and financially prepared to pay very large scale losses in 2016 and beyond, according to Insurance Information Institute (I.I.I.) president Dr. Robert Hartwig and chief economist Dr. Steven Weisbart. 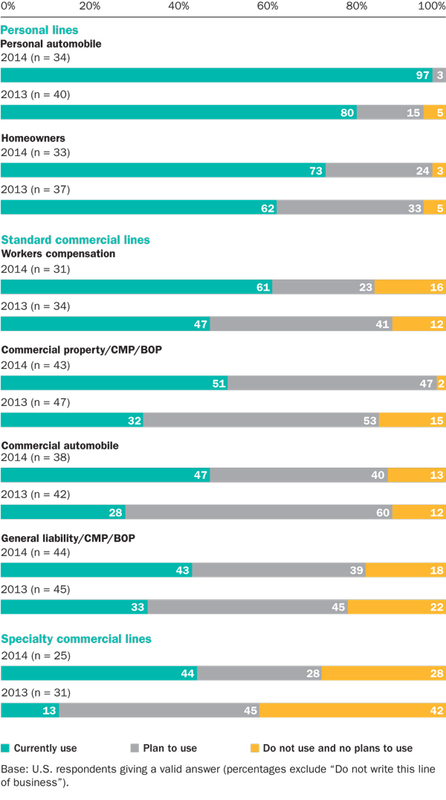 In their commentary on the industry’s 2015 year end results, Drs. Hartwig and Weisbart note that overall industry capacity remains near an all-time record high. At $673.7 billion as of December 31, 2015, policyholders’ surplus was down $1.5 billion or 0.23 percent from year-end 2014. The bottom line is that the industry is extremely well-capitalized, even in the face of disaster. 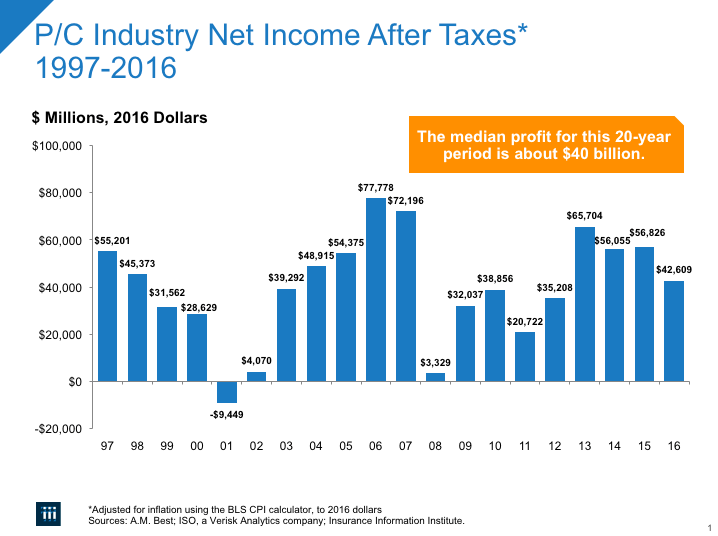 Other takeaways of the industry’s 2015 year end results: moderate profits in 2015, as measured by a return on average surplus of 8.4 percent, virtually the same as in 2014; modest premium growth (net written premiums in 2015 crossed the half-trillion-dollar mark to $514.0 billion, although the rate of increase slipped slightly to 3.4 percent growth from 4.2 percent in 2014); and a below-100 combined ratio for the fourth straight year (97.8 in 2015, compared with 97.0 in 2014). Cyber Security: A Credit Ratings Risk Factor? A new report from ratings agency Standard & Poor’s warns that the credit ratings of U.S. financial services companies could be vulnerable to cyber risks in future. S&P goes on to explain that while cyber attacks can result in losses, and possible market disruptions, so far they have not resulted in negative rating actions because the exposure of targeted companies has been contained by their own financial wherewithal and to some extent insurance programs. Nevertheless, the damage to reputation, brand, or competitive position may likely only truly be known in the years ahead. Our credit opinion takes a balanced view incorporating other related factors, including how susceptible a firm’s competitive position would be to a cyber attack, the effectiveness of its response plan, and what is the firm’s financial flexibility, liquidity, and capitalization regarding its ability to replenish capital post-event. While all financial services companies targeted by major data breaches have emerged intact, S&P says it is increasingly wary about the persistence of cyber attacks and what that might mean for consumer confidence to engage in commerce with the brand going forward. S&P says it views the threat for the insurance industry overall as medium, albeit risks for health insurers are higher. Adequate/strong enterprise risk management programs and the very strong capitalization of insurers are some of the offsetting risk factors. While the cyber insurance market is still emerging, S&P expects premiums to more than double to $10 billion in the next five to 10 years from $2.5 billion now.